Turning employees into social media superstars is one of the hottest trends to build authenticity and trust with consumers, while having some fun at the same time. Macy’s Style Crew member Michael Lira tells viewers about some of Macy’s fashions. Macy’s is the latest brand to recruit its own store employees as influencers. Interested employees began applying earlier this month to be part of the Macy’s Style Crew program. The chosen ones use their own social networks to reach their fans with videos, produced by both Macy’s and video platform Tongal, all around Macy’s products and services.The videos are shared on the employees social channels and housed at the Macy’s Style Crew site. Visitors can view employees showing off a wide range of products from bathing suits, to linens, to private-label fashions, according to Glossy. 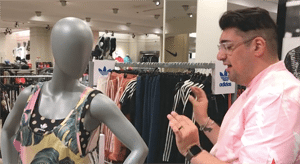 “The Macy’s Style Crew is a community of our very own colleagues who are passionate about sharing what they love most about fashion and style. Browse their content or follow #macysstylecrew on social media to stay updated on the latest trends!,” Macy’s says on the site. The employees have range to show of their own personalities, like the video showing Peeves the Bunny trying to get out of a Macy’s bag supported by the tweet from Donna V: “Please enjoy this video of Peeves the bunny hopping around in a Macy’s bag until I figure out how to delete it! #facepalm lol :)”. There’s also plenty of the more straightforward like the video from Leslie Peterson showing images of fun summer-style dishes like a pineapple serving dish and ice-pop molds. As the video rolls, an ad pops up showing the price and a “buy now” button. The incentive for employees, in addition to increased social exposure, is a portion of the profits. And, perhaps, the dream of becoming a true social media superstar. Using in-house employees offers a number of benefits that outside influencers can’t provide including that employees are well versed on the brand’s consumer-facing missions and have a solid understanding of the brand itself.Tapping employees is also a time- and cost-saver since marketers don’t have to hire an agency to seek out, vet and develop contracts for outside influencers. Other brands that have begun enlisting employees as influencers include Kate Spade, Everlane and The Vitamin Shoppe. Recently, The Vitamin Shoppe took its efforts to the local level launching Instagram accounts for each of its 800 locations. Each account lets local managers and employees promote events, daily specials and offers, and show off their personalities and expertise about a vast array of products. Employees are the social stars of Vitamin Shoppe. The brand has already tapped its staff members as influencers who appear on weekly Facebook Live Videos teaching workout sessions and health classes. So far there are Instagram accounts for about 400 locations. As employees handle the daily posts, there is also one community manager who oversees all the accounts and other social media channels.